Hey, Hey, Do You CSA? I have been meaning to write this post for a while now, but finally got around to it. Lots happening in the Howard County CSA world. New sites. New CSAs. First, I should talk about a conversation I had yesterday at our pick up site. I met someone I hadn’t seen before, new this year, with a full share gift from a relative. They loved the amount and quality of the veggies they got, for what they considered a great deal. $30 a week. The 60% share is only $19 a week. By the way, this couple travels from Anne Arundel county to our pick up site near Robinson Nature Center. She said they had few options in their area. I blogged a few weeks ago, about the sign up period for the seven week extension of our CSA, from November 7th through December 19th. It’s a short term commitment for someone interested in seeing what we get from a cooperative of farmers. How much is in a full share or a half share. Hanging around the pick up site, you can see what is in each box. Typical full share from last November is pictured above. I do know that we are dropping from 60+ shares for our summer CSA, into about half that number for fall. We heard reasons at the site. Not liking squash. Too many potatoes. For us, though, squash is an excuse to make hummus. Potatoes in a brown bag, hanging in the laundry room, will last for months. OK, enough about the Sandy Spring Fall CSA. Let’s talk about next year in the county. We are indeed lucky to have so many CSAs in Howard County. Next year, add another. TLV Tree Farm. And, another new pick up site for Breezy Willow. They will offer pick up at Wegmans. Cheers to Wegmans for supporting local farms. Just like MOM’s supports One Straw Farm, with pick ups at their Jessup store. All told, I believe we now have Sandy Spring, Breezy Willow, Gorman Farm, Love Dove Farm, TLV Tree Farm, Zahradka Farm and One Straw Farm. Amazing the options available with potential to have fresh veggies all year round. CSA’s. Try them. You might get hooked like we did. Posted in CSA, Farms, Food, Howard County, Local Businesses, Locavore and tagged CSA, farms, Food, Howard County, local businesses, Locavore. Bookmark the permalink. I’m hooked! 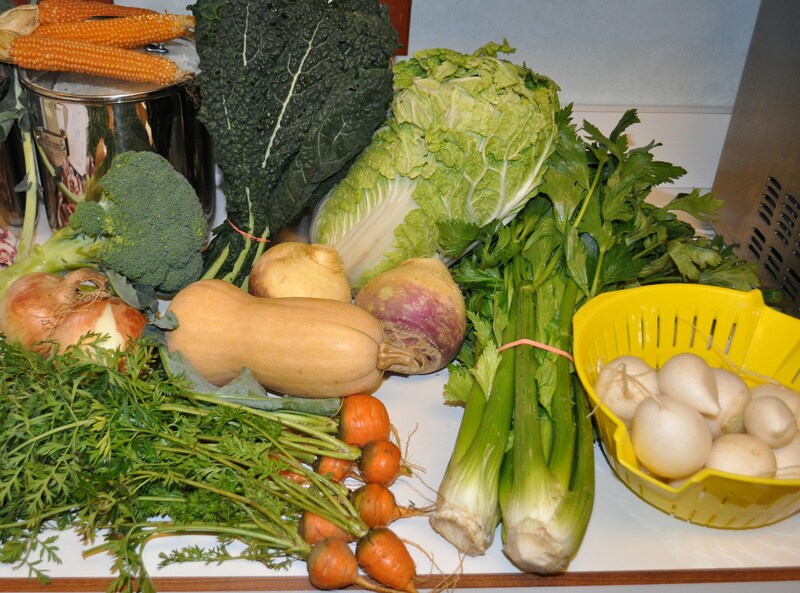 I’m looking forward to the winter Zahradka Farm CSA. I signed up this year, thanks to your reports and talking with one of their staff members at the Conservancy last winter. MOM’s will be a pick-up location for a couple of winter CSAs during the upcoming season. At Jessup and other MOM’s sites in MD and VA, there will be pick-up for a 7-week Lancaster Farm Fresh Co-op CSA beginning Nov. 4. At two locations in MD (but not Jessup) and one in VA, there will be pick-up for a 20-week Even Star Organic Farm CSA starting Nov. 1. This week’s One Straw Farm share contained lettuce, swiss chard, beets with greens, purple potatoes (with lavender flesh), sweet potatoes, delicato squash, broccoli, peppers (uncertain variety), and mystery greens. Last week I forgot the name of one set of greens from the list. This week my husband did the pick-up and the same thing happened to him. I’ve discovered that our CSA share for this week also included a second bunch of mystery greens (different vegetable than first bunch).